Music Crab is simple and free iPad designed to help students learn to read music. The app features a little crab that students move by playing virtual piano keys in the app. To move the crab students have to play the correct notes. If they play too many incorrect notes in a row, the game is over and they have to start again. 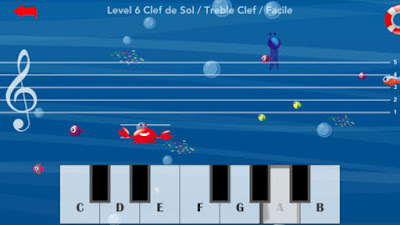 Music Crab features ten levels that students can progress through. Each level is a bit more difficult than the last. In each level the speed of the game increases and students have to improve their sight-reading skills in order to advance through each level.